Click here for a sample of ANC033. Jordan was inextricably articulated as a living, breathing, and dunking vindication of the mythological American meritocracy. Sociologist Max Weber identified charisma as being based on superhuman powers or qualities setting an individual apart as a natural leader. Exhibiting narcissist traits and exceptional amounts of energy, the charismatic benefit from an internal clarity free of the common anxieties limiting an ordinary person's achievements. Lacking the fears, shame, and guilt that obstruct others, these ostensible paragons display an exaggerated self-confidence rendering them all the more attractive to their followers. Over time, this phenomenon has enabled the supremacy of despotic monarchs, sinister cults, and in our celebrity-focused age, the herculean luminaries of professional sports. 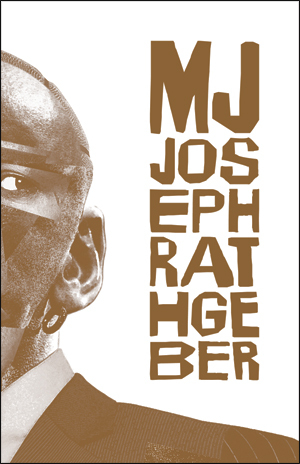 Joseph Rathgeber's MJ is a personal account of idolatry coming apart at the seams like a two-hundred dollar pair of sneakers. Using an extensive range of cultural, academic, and historical sources to fill empty spots in the Jordan mythology, this hybrid assemblage/memoir/epistolary project seeks to undermine the aracial and apolitical brand cultivated by one of America's great capitalist and consumerist icons. Examining the dark abstractions overshadowed by this heroic figure's hyper-competitiveness and rise to greatness, MJ collapses one generation's champion while so many seek to emulate his conquests. ANC033 is out of print.